Given that post-apocalyptic, Roman Empire-inspired RPG Age of Decadence was in development for over ten years, I did suspect that we'd be waiting a wee while for its subterranean spin-off Dungeon Rats to come out. But no, only a few months after its reveal, Dungeon Rats is set to release. It's a more combat-heavy RPG set in the same world as Decadence, and it'll be out on November 4. Here's the fresh-from-the-oven Steam page. 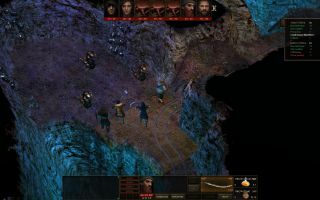 Dungeon Rats is a "turn-based, party-based RPG focused almost exclusively on squad level tactical combat", so don't expect to be able to talk your way out of much combat, as you could in the game it's spun-off from. As a new arrival at a gang-run prison mine, "you must fight to survive and develop your combat skills, acquiring better weapons and equipment as you go. Recruit allies to your struggle or carry on as a lone wolf, and kill anyone foolish enough to stand in your way". There'll be crafting and alchemy systems, a "fully customisable" main character, and—in a major change from Decadence—there'll be party-based combat, which you'll be doing with up to ten companions.